From looking at this Mirror headline you would think it was a waste collection story or even a 'right to privacy' issue. But what's behind it is actually a serious public health and education crisis. Over the last 20 years, since disposables became the norm, children are being potty trained later and later. The idea has taken hold that children potty train themselves when they are ready. This may be true in some cases but most need some intervention, or even better access to a potty from a year to 18 months. Public Health England has made toileting independence one of 10 'School Readiness Indicators.' These indicators determine the life outcomes of the adult. It's a serious issue. People who became parents more than 10 years ago are probably scratching their heads as to why such an indicator would be needed as until very recently only a small percentage of children wore nappies beyond the age of two and a half. If a small percentage of children arrive at school in nappies that's normal. When 30% of children arrive at school in nappies it is not. Across the World, where there is only scant use of single-use nappies the normal age for a child to achieve day-time toileting independence around 2. It was normal in the UK up until the 1970s. Children arriving at school in nappies is an educational issue (teachers spending time changing nappies rather than teaching) but it's also a poverty issue: families on low incomes spending money on nappies. It's also a health issue as children still in nappies after 3 are more likely to suffer from constipation and urinary tract infections. Preventing these problems saves our health service money and more importantly prevents pain and anxiety to the child and carer. Also, if children potty training between 3 and 4 is the norm it becomes less easy to identify children who have special needs where this may be a key indicator. Basically, it's not a good idea. Real Nappies for London has been working in this space trying to raise awareness of this growing problem since 2008. But this small demand by Anglesey Council has captured the public's attention in true Donald Trump style. This is an opportunity to get the information that we've been gathering to parents who need good advice on how to prevent their child arriving at school in nappies. Expectant and new parents watching this debate are learning. Who wants to be buying and changing nappies when their child is 3 if their child could be happily taking her/himself to the toilet up to 12 months before? Many have found out that they can catch their baby's poo or pee after a feed or at nappy change time or when baby wakes up from a sleep. Holding a baby vertically over a pot can make passing a stool easier and more comfortable for baby. It can also mean the next nappy stays clean and dry for longer meaning less risk of nappy rash. Is it time health visitors started modelling catching at Baby Clinic when baby is weighed? We have suggested this already and perhaps it's already happening in some clinics. In the USA Kandi Burruss has taken this practise to the mainstream via her blog. Parents with toddlers over a year old need good potty training advice. You can get it here. This page of the Real Nappies for London website was written with the advice and supervision of June Rogers, the UK's leading paediatric continence advisor. Parents with children who wear pants but are still wetting and soiling during the day or night need good advice. They can get it at Eric. Excellent advice re other issues such as bedwetting and constipation is also available form PromoCon. Parents with children with special needs can also get excellent advice from PromoCon, the charity that has supported so many parents of children with special needs to help their children gain toiletting independence. Nurseries that want to engage parents to potty train their children through play, looking at books and singing (at the same time encouraging imaginative play and language development) can access the services of the Lewisham-based charity Creative Homes. We need to call time on the scaremongering seen in this Huffington Post article. Children all round the world gain toileting independence around 2 years. The important point is for parents to access good advice like this from Amber Hatch or Born Ready and be made aware of the difference between 'catching' and the child taking control of their own body and knowing when they need the potty/toilet. This is typically where problems occur but they can be prevented if parents can find good information. Finally we need to applaud and respect Anglesey Council. They have had the courage to bring this issue to the public's attention. This is a brilliant opportunity. This simple action has the potential to accelerate the idea that the vast majority of children can be happily toileting independent and out of nappies by their third birthday. PS if your child is still wearing nappies beyond 3 despite encouraging use of the potty you will find using a terry towelling square or prefold inside a fitted modern waterproof nappy wrap means you save money on disposables and have no nappy waste for the binmen to collect. London has a new Mayor, Sadiq Khan and a new Chair of London Councils, Claire Kober, Leader of Haringey Council. There is also an increasing need for partnership working between councils to reduce costs. This is a good time to step up and make Real Nappies for London a truly pan-London information scheme. Building on our success and experience since 2007 we want to make it a low-cost, high impact service, offering cost savings to all 32 boroughs and the Corporation of London. Our mission at Real Nappies for London is to reduce London's nappy waste. One way to do this is to encourage more residents to consider/try reusable nappies. This reduces the cost of collection and disposal of nappy waste. The average baby generates approximately 763 kgs - almost a tonne - from birth to potty, costing an average £150 per tonne. The total annual cost of London's nappy waste is approximately £20 million. More and more parents are recycling and reducing their residual waste. They don't want to see it suddenly grow when they have a baby due to disposable nappy waste. 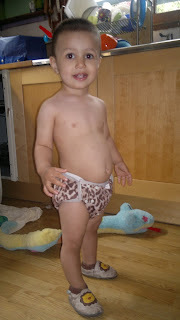 We are seeing increasing interest in cloth nappies. But reusable nappies are not practical for everyone. Another very good way to reduce nappy waste is by giving toddlers the opportunity to potty train at the earliest possible opportunity. It also reduces the cost of having a baby in nappies 24/7 until the child is three and a half or four. A primary school in a deprived area of Stoke reported to Channel 4 News (Dec, 2015) that a third of children presented for reception wearing nappies. The Foundation Years guidance to parents, 'What to expect, when? A Parents' Guide' endorsed by the Department of Education, says that a child typically indicate the need for a change of nappy/the potty/toilet from 16 - 26 months. It seems parents need better information on when and how to get their children out of nappies. The question is how can we give all London parents access to information about these 2 alternatives to disposable nappies that they can look up and use if they want to. All expectant mothers in London could easily be given information about www.realnappiesforlondon.org.uk with the prescription exemption card that is sent to virtually all expectant mothers within weeks of registering pregnancy with their GP. Devolution of power from Whitehall to local authorities should finally make this cost effective option possible. Another way to normalise the alternative to children spending the first 4 years of their lives in single-use nappies is to put posters on the side of refuse trucks. Currently most have recycling messages. But perhaps it's time use this space to tackle waste prevention and promote the circular economy? Let's make it happen. At Real Nappies for London, we have the expertise, we have the experience, we can make it happen. For more information on potty training please see our post: New Thoughts on Potty Training, endorsed by June Rogers, the most experienced paediatric continence advisor in the UK. later for no medical reason. Schools are installing nappy changing areas. Children’s education is being disrupted by it. It should concern all of us that reception teachers in some schools are spending time NOT teaching because 1 in 3 children in the class are not able to take themselves to the toilet. Public Health England has noticed this problem. It has made toileting independence one of the ten school readinessindicators. THe charity Foundation Years has also noticed. Its document, supported by the Department of Education: “What to expect, when?” tells parents “your child will tell you s/he needs the potty or to go to the toilet” at 16-26 months. London spends £20 million per year on the collection and disposal of nappy waste. At Real Nappies for London we are working to reduce this cost. We can think of better ways to spend £20 million. We need to start investing in giving parents and carers good up-to-date information about potty training. Let’s get positive about potty training and support parents in this important step. Because there are 2 ways to reduce nappy waste. One is to encourage parents and nurseries to use washable nappies. The other is to ensure children start using a potty/toilet at the optimum time. Why are we sharing a film of a disposable nappy being changed in Real Nappy Week? This beautiful film 'Dance of the Nappy' is a small section of Suzanne Zeedyk's film 'The Connected Baby.' It shows how important nappy changing is. It's not just a routine hygiene procedure/chore. It's actually a really important time for your baby to connect with you. Normal nappies ie disposables are marketed as convenient nappies that can last up to 12 hours and stay dry. We hear that babies are being changed less and less frequently but over a longer and longer period resulting in more and more children starting school still in nappies. We want to encourage parents and carers to change nappies frequently and really enjoy this contact time, to make it quality time. We also want to encourage parents to enjoy potty time and help their toddlers start wearing pants/knickers around their second birthday rather than their third or fourth! We believe that changing babies frequently will actually motivate parents to switch to reusable nappies. They will see the amount of waste produced and also how much money they are wasting and thus the advantage of reusables. Sharing this film also shows that at Real Nappies for London we prioritise the health of baby and parents in the early weeks. If parents choose single-use nappies during the first few weeks because they feel it makes their lives easier we support this choice. Of course we hope they will soon come to the conclusion that they want to switch to reusables so they can have the luxury of changing baby frequently without worrying about the cost and also reduce the environmental impacts of the nappy phase. Please continue to share this film. It's important. You may also want to read and share Suzanne Zeedyk's blog on why nappy changing is good for babies' brains. It's really important that we stop the idea that babies/toddlers should spend longer and longer in a clean and dry nappy that is changed infrequently. Disposable nappies appear to become thinner and more absorbent every year. In a way this seems good on an environmental level because it reduces the bulk of the clean nappies, thus reducing transportation and packaging impacts. But what is in the super absorbent polymers (SAPs) that enables this? And what are the long-term health and environmental impacts when the SAPs are buried or burned? Surely, if we are seeking to become a truly circular economy, the aim should be to make single-use nappies compostable; the aim should be to reduce the SAPs in single-use nappies as these chemicals are unlikely to be good for the soil. Making nappies even more absorbent raises questions about the business model of the disposable nappy manufacturers. Surely the less frequently babies and children are changed the fewer nappies are sold. The only way to ensure they sell the same number or more nappies is if children come out of nappies later and later. Surely this is not what parents want? Surely children staying in nappies longer is more work and expense for parents. Therefore if parents realise this and stop wanting nappies that stay dry longer and longer, stop wanting to change babies infrequently, then the manufacturers of single-use nappies will be able to reduce the amount of SAPs in the nappies, making composting disposables more feasible? If you are a scientist and can shed more light on the viability of composting single-use nappies please post a comment. We are keen to learn more. There is of course the issue of the water that is in the SAPs when they are incinerated or buried that we don't understand and no one seems to talk about. The NLWA (North London Waste Authority) is a big supporter of the Real Nappies for London incentive scheme, indeed had an influential role in establishing real nappy incentives in London. You can read more about the NLWA's support for real nappies here. What if Health Visitors modelled 'catching' in Baby Clinics? We know that babies tend to pee and poo when the nappy is taken off, right? 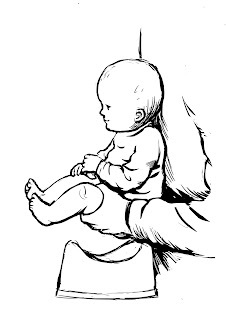 It frequently happens when baby is weighed at the baby clinic. Parent is embarrassed, mess has to be cleaned up? Why not have a small pottry or even a yoghurt pot or ice-cream/margarine container and the health visitor could demonstrate how to catch a baby's pee and/or poo? Want to know more about catching? Most babies will let you 'catch' until around 6-9 months. 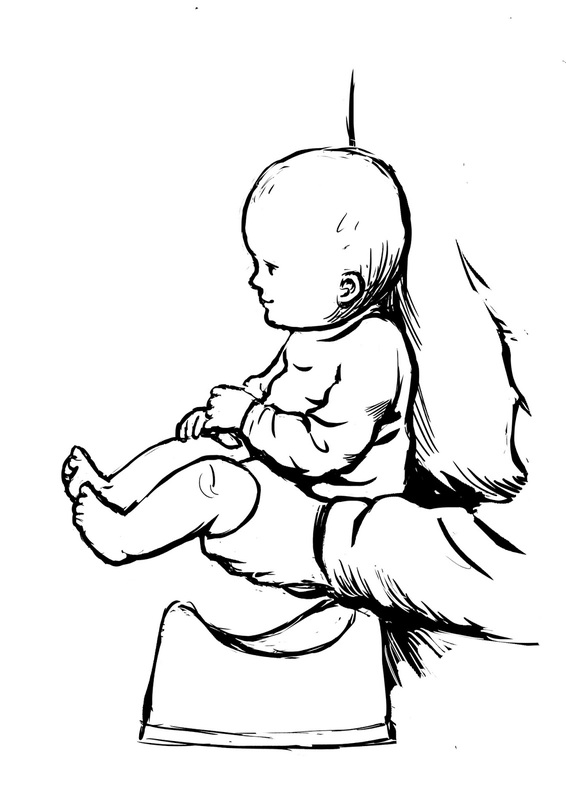 For most success offer the pot at specific times when your baby is likely to have a poo or pee waiting. Your baby is an individual so watch and find out his/her pattern. As a rule it's often after a feed and also on waking (the sensation of a poo or pee waiting may be what has woken your baby.) If you catch a poo and/or pee the next nappy stays clean and dry for longer. It saves you money too if you're using disposable nappies. 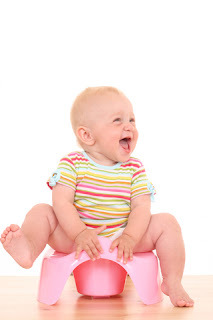 Some people say babies who have had pees and poos caught in the early months are more relaxed about using the potty/toilet when pottry training happens. We need more research, but this is certainly what happens in parts of the world where nappies are not used. What's important is to ensure parents know the difference between catching - a reflex, stimulated by fresh air from the nappy being off and being held vertically - and potty training, which is the child being given the opportunity to develop bladder and bowel control. See Born Ready's 30 sec cartoon on You Tube about catching here. Why should #CCGs spend money on #nappies? As you may have heard, on 10 March, The White House (yes, the office of the President of the USA) launched a project about nappies #diapergap. In the USA, 1 in 3 children are not having their nappies changed frequently enough. This is a public health issue. Babies and toddlers are experiencing severe nappy rash, UTIs (single-use nappies are being dried out and used again) and constipation (parents restrict fruit and veg in the diet so there are fewer soiled nappies) because they can't afford an adequate number of disposable nappy changes. I'm not aware of any data on this in the UK but anecdotally we have been aware of this for many years. It's one of the reasons why health visitors have welcomed Real Nappies for London and been willing to distribute our leaflets. What we do is promote the use of washable nappies. These nappies have an upfront cost but once bought there is no financial incentive to change infrequently. They just need to go in the wash. We are aware of course that some households, those in most need, may not have a washing machine or adequate drying space. Affordable nappy laundry services could meet this need. But there's another benefit to cotton nappies; they can help children gain toiletting independence. This is not automatic, but it tends to help. Again this is a public health and education issue. We don't have national data for children arriving at school in nappies but Public Health England has made children being able to take themselves to the toilet 1 of 10 indicators of school readiness. More shocking was a report on Channel 4 news in December 2015 in which a Stoke primary school teacher said that 35% of chilren arriving for school in September were still in nappies. The promotion of washable nappies in the UK started 20 years ago with the first Real Nappy Week. At that time disposable nappies enjoyed 95% of the market. Over the last two decades there has been an incremental growth in the use of cloth nappies. Most users are motivated by reducing waste. Local authority recycling and waste prevention departments have funded schemes to make expectant parents aware that there are alternatives to disposable nappies. In some parts of the UK this work is done by volunteers who have set up 'nappy libraries' so people can try before they buy. The main thing for public health is that we talk about the need for a positive attitude to changing baby and potty training, the need for frequent changes and a healthy diet. Nappy changing culture is a public health issues. What's important is that something is happening in your area. It doesn't have to cost much. It's all about spreading word of mouth about the need for frequent nappy changing, where to get affordable cloth nappies (yes, some are very expensive) and good potty training information ie not "wait until your child is three and a half your child will potty train her/himself." We are working with June Rogers, founder of the charity PromoCon to give parents the best information on how and when to potty train, based on the latest research and data. This advice for parents has been edited by June. Creative Homes, a social enterprise based in Lewisham, supported by the Design Council, is doing innovative public health work with families including potty training. If you are a member of a CCG and want to talk about what needs to happen in your area to decrease the negative impacts of infrequent nappy changes and children arriving for school in nappies in your area please get in touch with Real Nappies for London. We have a lot of experience of different things working in specific circumstances at a very low cost. Today we launch our RNW2016 writing competition. Please email us your story about why you use real nappies, or how you came to use them or anything about reducing disposable nappy waste. We know that expectant and new parents love to read about your experiences. If you can provide some photos to illustrate your story all the better. It doesn't have to be long. You may just want to put a very simple point across. We will publish your story on our blog as a guest post. The one which has had the most views at 12 noon on 9 May (2 weeks after the end of RNW) will be the winner. The winner/s will get a 1.3kg bag of eco-friendly Rockin Green laundry detergent donated by Nappy Ever After. As you can see from the Real Nappies for London blog, our guest posts are the most popular. Please send them in as soon as you can. We will be promoting on Twitter and Facebook and encourage you to share within your networks to get the most views - especially Mumsnet, Baby Centre etc. We look forward to receiving your stories! Terms & conditions: Please ensure this is an original piece of writing by yourself written for the purpose of this competition and has not been published anywhere before. Copyright of any photos must be with you. Max length is 300 words. The election of the next London Mayor in May is an opportunity to raise the issue of London's nappy waste. Real Nappies for London is a pan-London leadership initiative that brings together local government, business and community change agents to advance the prevention of disposable nappy waste. With efforts traditionally focused on ‘end-of-pipe’ waste management ie incineration, landfill or even recycling, Real Nappies for London is pioneering a shift upstream - calling for city-wide action to address nappy waste generation. By reframing the conversation, Real Nappies for London is positioning waste prevention and the circular economy as an opportunity for innovation, job creation, competitiveness, cost saving and improving public health. Founded by the Women's Environmental Network (WEN) and now administerd by the London Community Resource Network (LCRN), this pan-London project is uniting local governments, including five of North London’s local authorities - Hackney, Camden, Islington, Haringey and WalthamForest, plus Bexley and Tower Hamlets – with key stakeholders, influencing change on a national scale. Real Nappies for London is committed to helping reduce disposable nappy waste in London. A baby in single-use nappies produces approximately 7kg of nappy waste per week. The Waste and Resources Action Programme (WRAP) estimated in 2008 that the average baby wearing nappies until 2.5 years old generates 874 kg of nappy waste, nearly a tonne. Every year more than 130k babies are born in London and most wear single-use nappies because parents/carers are not aware of easy washable alternatives. If all parents receive consistent, accurate information and support the vast majority could use washable nappies. Also the trend has grown for toddlers to stay in nappies a lot longer. This means the nappy waste can be even more. We are committed to developing and sharing the best information to help parents and carers potty train their children successfully. Nappy waste in residual household collections can be as high as 9% and costs Londoners a staggering £20 million per year. Children staying in nappies longer than necessary is also a household cost that families on low incomes cannot afford. Gather data and find out what is happening: Commission research to find out how many babies in London wear washable nappies. This research would show the impact of current incentives that have been used in different boroughs to increase uptake of washables. Commission a study: to find out the knowledge and expectations parents have of how and when to potty train. This will enable you to ascertain how to reach parents in most need. This could be done quite cheaply in partnership with a mainstream online parenting player like the Baby Centre. Make real nappies seem normal: make as commonplace as recycling by putting messages about real nappies on the sides of recycling and refuse trucks. Support nappy washing businesses: small flats with no outside drying space make washable nappies inconvenient for some London families. You need to find out how to support nappy washing businesses across London that can take care of the washing. The Women's Environmental Network (WEN) has been campaigning for waste minimisation for almost 20 years. Reducing disposable nappy waste is part of the circular economy agenda and WEN supports this manifesto. Raising awareness of alternatives to disposable nappies and potty training not only reduces the cost of waste collection and disposal, it also creates green jobs, stimulates community engagement and local enterprise, can prevent significant public health costs and save households money. As a national charity PromoCon works to provide information and advice around all aspects of continence for both adults and children, including advice and support for toilet training. We welcome any initiatives that not only helps to inform parents and promotes timely toilet training, but also helps identify key issues regarding what influences parental choice about the type of nappies that they use (washable or disposable) including whether having a child with a disability impacts on their choices. We would be happy for Real Nappies to have links to the toilet training resources within our website. Wandsworth Council supports waste reduction where this can be achieved cost-effectively. It therefore endorses this manifesto subject to the actions it contains being implemented cost-effectively.